A View of the Mountain Pass Called the Notch of the White Mountains (Crawford Notch), 1839, oil on canvas by American artist Thomas Cole (1801–1848). Image courtesy of National Gallery of Art, Andrew W. Mellon Fund. So, would we surrender to the demands of trendiness and offer to our readers another Hawthorne tale? Of course! 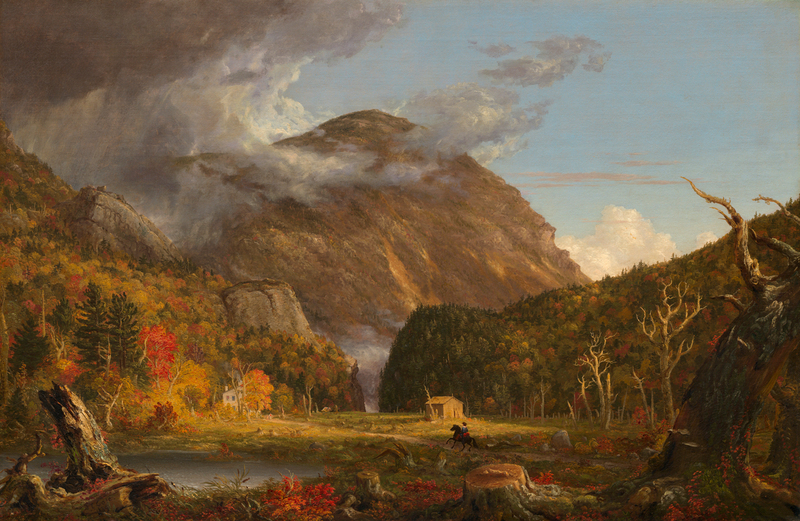 “The Ambitious Guest” portrays a young man traveling in the White Mountains on his way to Burlington; he stops at a cozy family-run inn in the awe-inspiring shadows of Crawford Notch. Just starting out in life, the man seeks “a high and abstracted ambition” and a fame that will last long after he is gone; he wishes “not to be forgotten in the grave.” Although the characters in the story are all unnamed, Hawthorne based his story on the Willey Family incident of 1826, which dominated the headlines of the day and turned Crawford Notch into a destination for tourists. The episode also provided the initial inspiration for a group of painters who came to be known as the White Mountain artists. We’ve included a link to information on the historical event and its cultural aftermath at the top left, but we offer fair warning: you should not read anything about it if you want to avoid finding out how the tale ends. Let’s just say that the moral of the story is that you should be careful what you wish for. One September night, a family had gathered round their hearth, and piled it high with the drift-wood of mountain-streams, the dry cones of the pine, and the splintered ruins of great trees, that had come crashing down the precipice. . . . If you don't see the full story below, click here (PDF) or click here (Google Docs) to read it—free! Thanks for another Hawthorne selection. It's difficult to comment on times like this in times like This. Nevertheless, a good story about a quick decision that didn't work out. Fate gave them two chances: once when the boy suggested the outing, and the second when the revelers called out for the Father. You ignore Fate at your own peril. An excellent story. I have grown to love Hawthorne's stories, because of the Library of America 'Story of the Week" selections. Prior, I had read The Scarlet Letter in school, but didn't care for it and found it boring. I feel so very fortunate now for being reintroduced to such an amazing author's works! Thank you LOA! Thank you...so much to learn and in reading this I learned about more than just the art of writing. As well as the story form I took notice of the comment above that speaks of fate and the two chances to escape the tragedy in the landslide. Again thank you very much for publishing this story. A very good example of cosmic and tragic irony. Look at the incongruity between what could have been and what actually occurs.Fate and Nature seem to conspire and destroy the loving, lovable family. Why did the dreamer walk into their midst? Is it because he is a kindred soul sharing a common fate? A secluded house full of happy,innocent people in the bleakest spot in all England - the tragedy was waiting to happen. The story is sinister and dark. The old woman's wish is morbid. The young man's dream for earthly immortality are ominous and full of foreboding. It is indeed a very gripping story. This is a favorite story of mine.